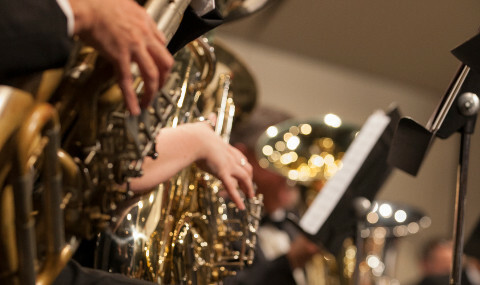 The Quad City Wind Ensemble prepares the start of a new season with “British Band Classics,” October 22, at 3:00 PM at St. Ambrose University’s Galvin Fine Arts Center. 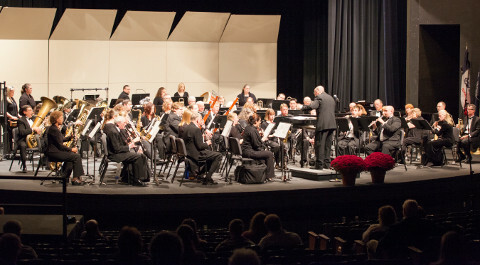 The cornerstone of the modern band repertoire was laid by visionary British composers such as Gustav Holst, Ralph Vaughan Williams, Gordon Jacob, and others. These men adapted the British brass band tradition to create a new medium: the “military band,” which incorporated woodwinds. These composers and their landmark works remain among the most significant works for the contemporary symphonic bands and wind ensembles. Along with his original band works, symphonies, and other compositions, Ralph Vaughan Williams (1872-1958) served as musical editor of the most important book of Anglican church music, the 1906 English Hymnal. Many of the tunes he collected and harmonized served as the impetus for other compositions, such as the three organ preludes of 1920. Based on Welsh hymn tunes, the best-known of these is probably Rhosymedre. The melody is simple, made up almost solely of scale tones, yet Vaughan Williams constructed a piece of grand proportion, with a broad arc that soars with the gradual rise of the tune itself. Walter Beeler arranged the lovely prelude for concert band in 1972, marking the composer’s centenary. Gordon Jacob’s (1895-1984) magnum opus was undoubtedly the William Byrd Suite, composed originally for orchestra. The band edition, now a classic, came about on the recommendation of Adrian Boult, as part of the music for an exhibition and promotion of British national art and spirit. At this same time, Jacob, still a student at the Royal Academy of Music, composed the Original Suite, the title given by the publisher Boosey and Hawkes. Jacob said of that decision, “At that time very little original music was being written for what was then ‘military band,’ so the title was a way of distinguishing that it was an original work rather than an arrangement–not that the music was original in itself. It was an unfortunate title, I know.” The entire piece emulates the folk tunes in wide use by other band composers. With two brisk outer movements, the dramatic climax is found within the Intermezzo, a beautiful tune ushered in by a solo alto saxophone with increasing chromaticism and even implied Impressionistic references. While the First Suite by Gustav Holst (1874-1934) is based entirely on original material, the Second Suite in F is an arrangement of folk songs and morris dances. A very British style March leads to an instrumental version of one of the composer’s choral works, the “Song without Words.” Complete with an anvil, the “Song of the Blacksmith,” is particularly evocative, while the “Fantasia on the Dargason,” combines the main theme with “Greensleeves” in several variations and concluding with a duet for piccolo and tuba! Colin Matthews 1984 edition aims to return more closely to Holst’s original scoring, and that is how we will offer it, only a bit larger than the minimum complement of 23 players. It’s a whole different sound of this well-known work. I think you’ll like it. Grainger wished that he had never written Country Gardens, a light piece of froth that sent audiences clamoring at every one of his concerts. It remained in constant demand as an encore wherever he went. In the 1950s, Leopold Stokowski came to Grainger with a proposition to re-arrange much of his music for a unique recording project. The 1953 version of Gardens is a radical departure from the original. Contained within are at least two “mistakes” in the harmony, the first of Grainger’s jokes. Later, one can hear the trombones sticking out their tongues at the bourgeois audiences who refused to adopt any of his other works. It’s all good fun. We’ll try to get Stokowski’s wind tempo! “Gum-sucker” is an Australian nick-name for Australians form in Victoria, the home state of the composer. The eucalyptus trees that abound in Victoria are called “gums,” and the young shoots at the bottom of the trunk are called “suckers”; so “gum-sucker” came to mean a young native son of Victoria, just as Ohioans are nick-named “Buck-eyes.” In the march, Grainger has used his own “Australian Up-Country-Song melody, written by him to typify Australia, which melody he also employed in his “Colonial Song.” Gum-suckers March is the final movement of the suite, “In a Nutshell,” but has become a stand-alone favorite. WHERE: Allaert Hall, Galvin Fine Arts Center, St. Ambrose University, Davenport, IA. TICKETS: Adults $10.00; Seniors $8.00; Students high school and under: FREE.